An innovative approach to academic advising is proposed as an intervention for college students with Attention Deficit Hyperactivity Disorder (ADHD). The advising model proposed uses a student-centered developmental approach that included specific elements of coaching, such as open ended questioning, creating a safe space for students’ difficulties with self-regulation, and holding students accountability for their actions. Five students with ADHD were tracked weekly over a semester, as they met with their advisor to provide added insight on this hybrid model of advising. Overall student perception and advisor perception regarding academic progress, commitment to academic goals, and progress towards outcomes were examined to determine the efficacy of such an approach for college students with ADHD. Given the ubiquitous nature of academic advising on college campuses, such a hybrid model of advising can have significant impact on graduation and retention of some students with ADHD, who might otherwise drop out of college, despite necessary competencies for postsecondary success. This project was a collaboration between LCIRT's Dr. Manju Banerjee and Landmark College academic advisor Kathy D'Alessio. Publication of the results from this project are scheduled to appear in the Journal of Postsecondary Education and Disability (JPED). In partnership with University of North Carolina, Charlotte – Dr. Jane Gaultney and Dr. Hannah Peach. Survey of sleep habits and patterns over two years of college students with and without LD. This project started in March 2015. In partnership with Director of Short-Term Programs, this research investigated the effect of a mindset shift intervention on High School Summer Program students’ perception of mindset flexibility, hard work, and constructive criticism. 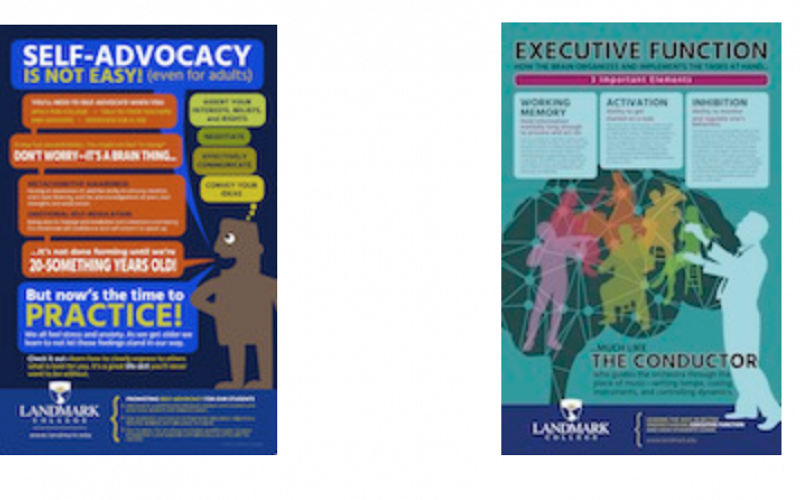 This project is in partnership with the Student Affairs Office at Landmark College.This is a pilot project to examine the potential effects of exercise on cognitive and academic achievement. The project involves testing students in a battery of cognitive executive function tasks, and measuring academic outcomes, before and after a vigorous exercise regime, compared to a group not as engaged in physical activity.